This is unbelievably good! Crispy chicken combined with the sweet and tart of fried green tomatoes. Amazing! Fry the chicken strips according to directions or use your favorite breaded chicken strip recipe. At the same time make the fried green tomatoes. Toast the sandwich bun. Spread a generous amount of mayonnaise on the top and bottom sandwich bun. 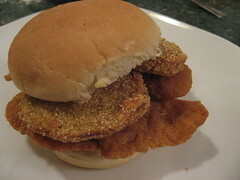 To assemble: place one or two chicken strips on the bottom bun, add two fried green tomato slices, garnish with lettuce and several dashes of hot pepper sauce, and finish with the top bun. I listed the hot pepper sauce as optional. But, it’s really not. I highly recommend it. You can leave the lettuce off if you want.